Spring has magically breathed life into the earth and little green shoots and leaves are sprouting all over my garden. Brown is giving way to green and buds are bursting open to reveal their jewel-hued personalities. It seems that life is everywhere in its most vibrant and vigorous avatar. These days I delight in exploring the corners of my garden, looking for new life, and each time I spot a new flower or a tiny green baby leaf peeping out of the soil, my heart does a gleeful somersault. Love these little joys and my days would be so dull without them. Since the days are warm with a gentle breeze, I love eating outdoors. And eating outdoors in this weather means fresh, light meals that echo the sunny days filled with light and life. 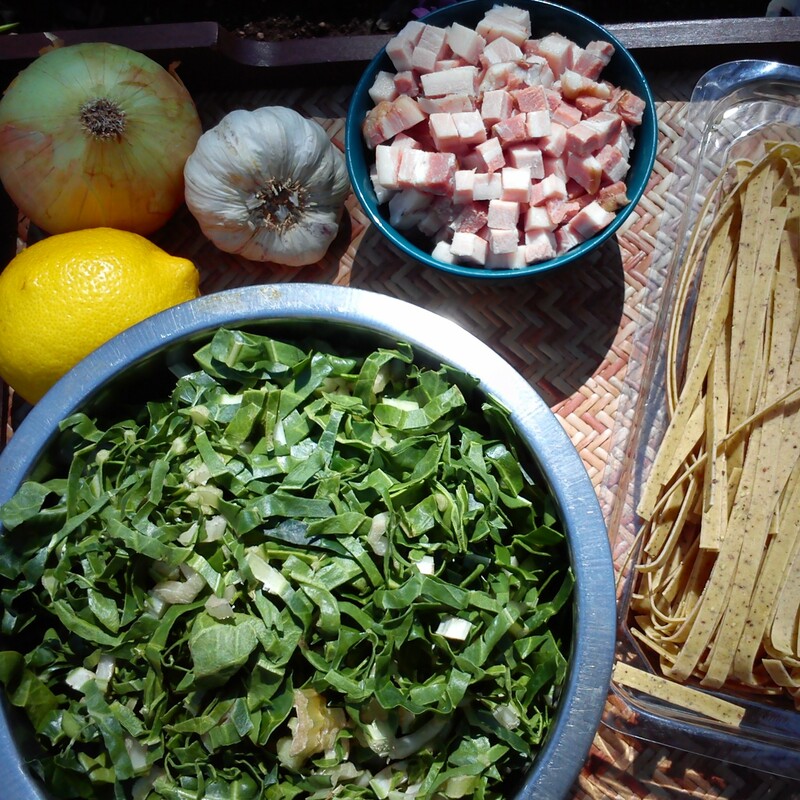 I wanted to rustle up a quick yet delicious lunch without spending too much time in the kitchen so I raided my cupboard and voilà!…I retrieved some delicate ribbons of handmade, lemon-pepper tagliatellini and buttery, tender smoked pork belly bought at the local food market. Grabbed fresh spinach, garlic, a tangy lemon and some cream and lunch was ready without breaking a sweat. You’ll notice that there’s no oil or butter in the recipe. That’s because I didn’t use any – the pork renders enough fat to cook with and so will bacon. Also if you want to skip the cream altogether, dissolve a tablespoon of cornflour in the stock to get that creamy sauce. Boil a big pot of water with a little salt and cook the pasta till al dente. Drain and set aside. Put a pan on medium heat and throw in the pork belly/bacon and onion and sauté for 5 minutes and then add the garlic and cook for a further minute. Now add the pasta and mix well to ensure that the sauce coats all of it. Serve immediately.